In this article we will be looking at, and recommending, a critically acclaimed recording of the cello version of the Schumann Drei Fantasiestucke, Op. 73, as well as including a selected video clip of a live performance. Although these three “Fantasy Pieces” were written originally for Clarinet and Piano, Schumann himself stated that the instrumental part could also be played on the cello or viola. It is always best to listen to as wide a variety of interpretations of a piece you are preparing for exam or performance, as possible, as this encourages you to ask yourself questions about what you want do with your own musical interpretation. Here at exam accomaniment we stive to offer you a blank canvas with which you can thoroughly prepare your piece, so when you go on to play live with a piano accompanist, you will be as technically prepared as you can be, and able to take your musical ideas even further. This video features the great Martha Argerich accompanying the fine French cellist Gautier Capuçon, live at the Verbier festival in 2011. Argerich is both a great concert pianist and accompanist in her own right, and this nuanced performance highlights the excellent reciprocal relationship between instrumentalist and piano accompanist. Grammophone also write: ‘Could this be his best recording yet? … [Fantasiestucke] has a wonderfully considered and luxuriant aspect; the results never sound contrived. That’s partly to do with Isserlis’s sound, which has a very focused centre to it, but also his utterly intimate relationship with pianist Dénes Várjon. 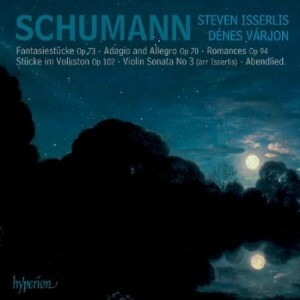 This is a must-own recording for anyone playing these wonderful gems by Schumann.